SQL Server Reporting Services were great in the past. SSRS 2008 are better. MSDN is great. MSDN has lots of details. Sometimes it’s too much if you are under pressure. Google usually gets me the information I want faster. Especially when I need to get something done quickly. All in all this post is for those of you that need to learn how to use SQL Server Reporting Services fast or need to solve the above mentioned problem fast, without knowing too much about the details. I read a lot of and like these introductory posts and so now I’m writing another one, here goes. – RSConfigTool – (Start menu > SQL Server 2008 > Configuration > Reporting Services Configuration): What do I need it for: Troubleshooting, Finding Urls, Configuration Report Server. Having problems trying to connect. See Additional Tip #1.
and of course you will need SQL Server Management Studio for managing the data the report is based upon. There are ways to aggregate your data in the report itself, but it’s easier and cleaner to use SQL views to provide the data for the report and use Reporting Services only for the report. So go to SSMS and create your view. 2. 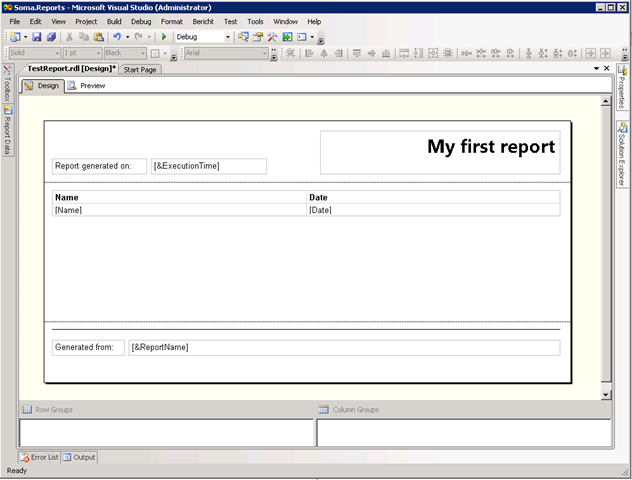 Create a new BIDS (Business Intelligence Development Studio) solution based on the “Report Server Project” Template. Add a new report by clicking on the Report node in the Solution Explorer. Next we need to connect to a data source. Give it a name, click edit and connect to your database. 3. Click next and the Query Designer appears. Here you enter the T-SQL statement for your data. Ideally it’s just a “SELECT * FROM yourView” (or select each column distinctly). You can test it using ‘Run Query’. You can also choose to use data from a stored procedure if you like, just select the appropriate option. 4. Design your report. You can add elements to the report surface, by right clicking on the center surface and select them from the insert menu. The most important are Header, Footer and Table. In the Header and Footer you can add Textboxes with text or by right-clicking on them and choosing expressoin you can choose some variable input. For example page number, report name etc. 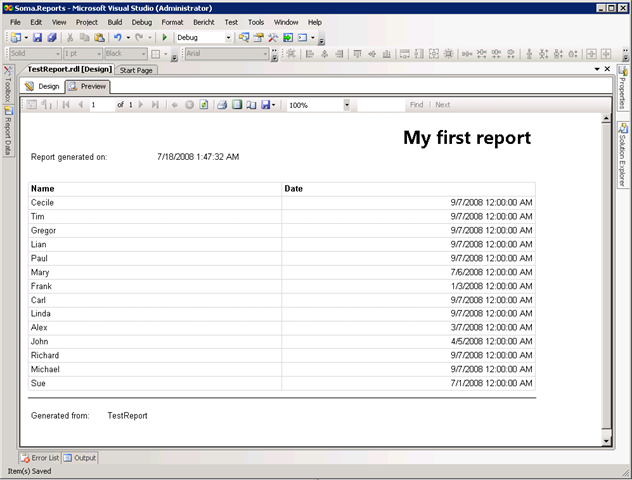 In the table you can drag columns from the “Report Data” (on the left showing the data source you just added). When you are finished, you might have something like this. Click preview to get a glimpse at what your boss might get. 5. Now let’s deploy it to the report server. First we must set the report server url. Right-click on the solution in the Solution Explorer and click on Properties. You will see the following dialog. 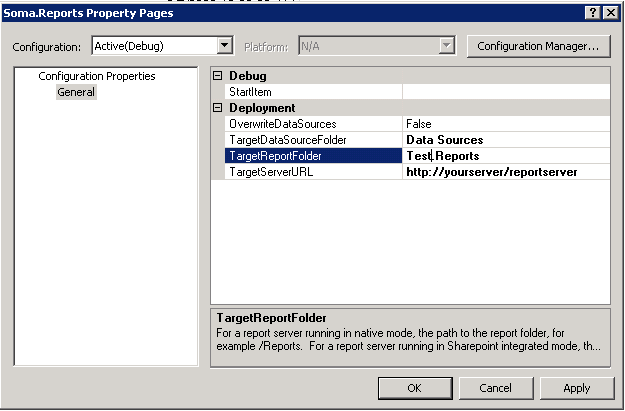 Change the TargetReportFolder value to something you wish and provide the TargetServerURL as http://yourserver/reportserver (not just /report!). Press save. Now right-click on the solution again and select Deploy. 6. When it finishes open the url http://yourserver/report (not /reportserver!). You will see something like this. Go ahead and click on Test.Reports (or whatever you specified as TargetReportFolder) and then click on your test report. You will be greeted with the web version of your report. 7. Now your Boss will not want to go the web page to get that report, so let’s look at sending it to him per email automatically. First we need to change the security settings for connecting to the data source. In the report page, click on Properties > Data Sources. 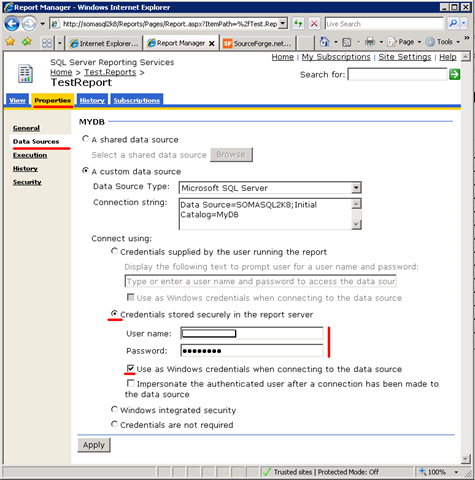 Change the “Connect using” to “Credentials stored securely in the report server” and specify an account that has access to the data. Also check “Use as Windows credentials…”. 8. Now you can go to Subscriptions. Click on email. Don’t have email as an option? See Additional Tip #2. Enter the recipient information as you wish and select a schedule for the sending. If you press save and encounter an error that ‘SQL Server Agent is not running’ either figure it out yourself what the problem could be or read Additional Tip #3 :). Once you have finished, lean back and let SSRS make your boss happy and in turn make you happy. So we have seen the absolute basics of report creation. A quick and dirty introduction. This should cover your first encounters with SSRS. Hope it helps someone! I try connecting with SSMS (Management Studio) and it won’t connect. Maybe you renamed the server? Open RSConfigTool, go to Database > Change Database > Choose an existing report server database. Just choose the existing one, and let it run through it’s config. That should repair everything and you should be able to connect using SSMS again. You don’t have email in the options for delivery in the subscriptions dialog? Probably it’s not configured. Thankfully that is very easy. You start the RSConfigTool. Connect and go to the Email tab. There you just specify a sender address and the SMTP server you would like to use. Click apply and voila. The server will automatically restart and the now the email option appears. 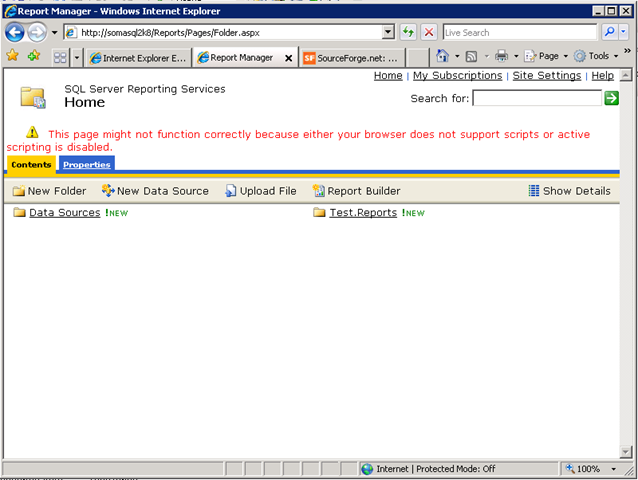 Saving the subscription results in an error message saying SQL Server Agent is not running. 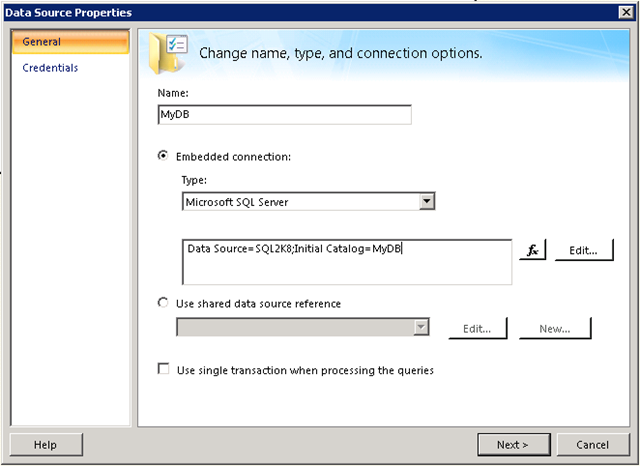 This is a DB or sysadmin issue, but just fire up SQL Server Configuration Manager (in the Start Menu under SQL Server 2008 > Configuration) then click on SQL Server Services, right-click on the SQL Server Agent > Properties. Go to the service tab, change Start Mode to Automatic and press OK. On the next reboot it will start automatically, but you still need to start it once for now. Right-click on the ‘SQL Server Agent’ and press Start. Oracle Reports is Oracle’s award-winning, high-fidelity enterprise reporting tool. It enables businesses to give immediate access to information to all levels within and outside of the organization in an unrivaled scalable and secure environment. Using Oracle Reports, you can rapidly develop and deploy sophisticated Web and paper reports against any data source (including an Oracle database, JDBC, XML, and text files). Leveraging Java EE technologies such as JSP and XML, you can publish your reports in a variety of formats (including HTML, XML, PDF, Enhanced Spreadsheet, Spreadsheetdata, delimited text, delimiteddata, PostScript, and RTF) to any destination (including e-mail, Web browser, WebDav, FTP, Oracle Portal, and file system) in a scalable, efficient manner. Oracle Reports consists of Oracle Reports Developer (a component of the Oracle Developer Suite) and Oracle Reports Services (a component of Oracle Fusion Middleware). For more resources for information about Oracle Reports, refer to “Related Documentation” in the Preface. For more information, refer to the Oracle Reports online Help (select Help > Contents in Oracle Reports Builder), and the Oracle Reports Building Reports manual. Oracle Reports Bridge (rwbridge) provides functionality for discovering a Reports Server across farms. For more information, see Section 2.3.4.1.2, “Server Discovery Across Subnets”. Oracle Reports Client (rwclient) provides a command-line interface to send a report to a remote Reports Server (rwserver). rwrun (Reports Runtime) runs a report by starting its own in-process server (not to be confused with the default in-process Reports Server), which runs in the same JVM as the rwrun process. The configuration file for this in-process server is rwbuilder.conf and trace files are saved in the rep_machinename-rwbuilder directory. It is recommended that you use rwrun for testing purposes only. Use rwservlet and rwclient in your production environment to take full advantage of the power of Oracle Reports Services. 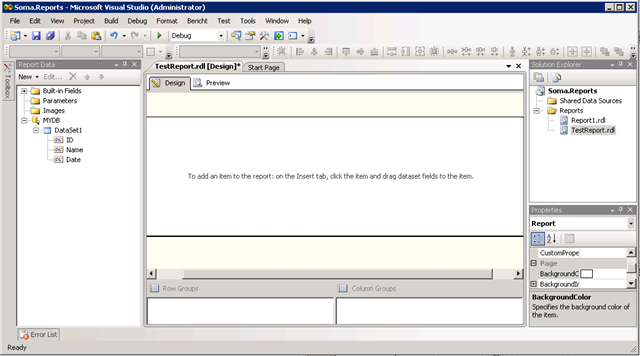 Oracle Reports Servlet (rwservlet) is a component of Oracle Reports Services that translates and delivers information between either a Web Server or a Java EE Container (for example, Oracle WebLogic Server) and the Reports Server, enabling you to run a report dynamically from your Web browser. Oracle Reports Server (rwserver) is a component of Oracle Fusion Middleware that provides reporting services to execute, distribute, and publish your reports for enterprise-wide reporting. This component processes client requests, including user authentication, scheduling, caching, and report distribution. Use Oracle Reports clients such as Oracle Reports Servlet (rwservlet), Reports JSP, and Oracle Reports Client (rwclient) to send a report to Oracle Reports Server (generally referred to as Reports Server). 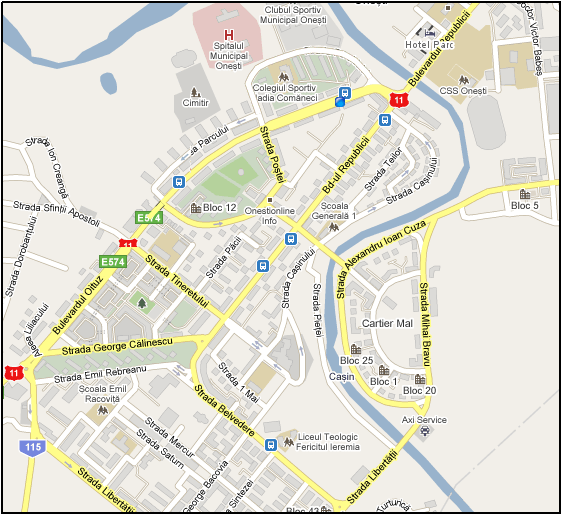 Google Map Maker allows you to add and update geographic information for millions of users to see in Google Maps and Google Earth. By sharing information about the places you know, like businesses in your town or places in your school campus, you can ensure the map accurately reflects the world around you. Your updates will be reviewed and once approved, will appear online for people from all over the world to see. 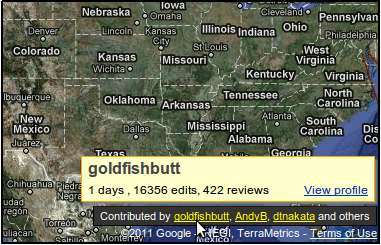 You can make edits using Google Map Maker over 188 countries and regions around the world. Start mapping today! Add places of interest such as your local restaurants, cafés, schools and more. Edit and update details for existing places. Help avid hikers by mapping trails, be it for a casual walk or an adventurous trip! Get driving directions and also help in making them more accurate. See what your peers are mapping in specific areas. Viewport: The viewport displays the map that you’re working on. This is where you can add, edit and review features. You can use the navigation controls to zoom in and out or move around the map, and switch between Map and Satellite views. To view stats for top contributors to an area, hover your mouse pointer over the contributors’ names in the right bottom corner of the viewport. Street View: An orange pegman indicates that Street View is available; a grey pegman indicates that it’s not available. 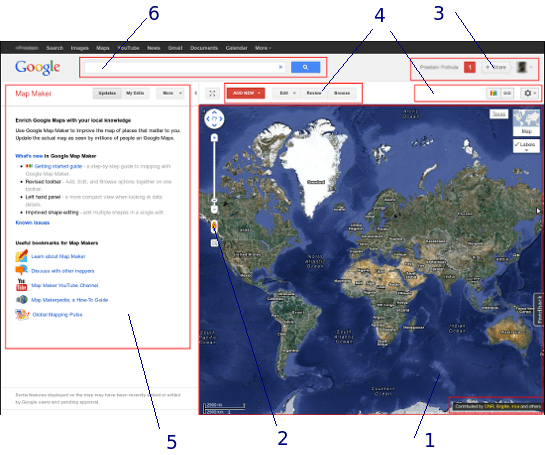 The lower right corner of the viewport has a Street View preview. Top menu bar: After you’ve signed in, click the gear-shaped icon in the upper-right corner to display links to your Profile and Settings pages. You can also find links to Labs features, the Discussion Forum and the Help Center. Toolbar: The toolbar is enabled when you zoom in to a particular area. Use it to add features such asPlaces, Shapes and Lines. You can also use it to find and edit features. Left panel: Displays information about updates, edits and directions related to the current action you’re performing. Learn more about the left panel workspace. Searching tools: The search box, along with Browse and Advanced Search will help you find businesses, schools and other places of interest. Learn more about searching. 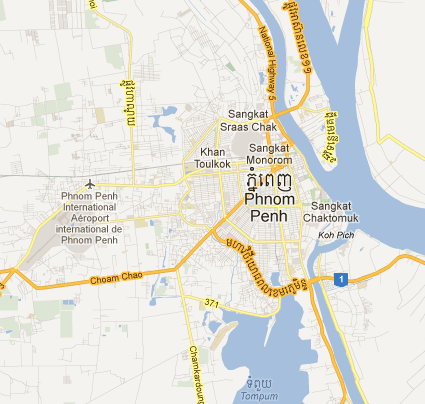 Location bar: Displays your current location based on the area represented by the viewport. You may need to zoom in to view this information. 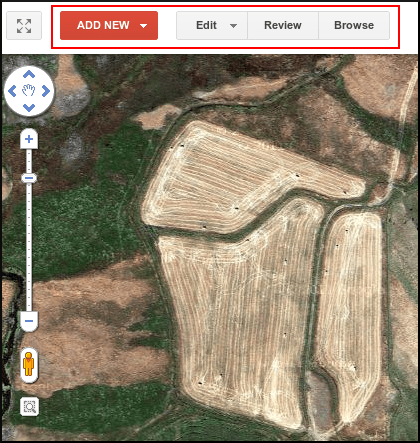 Getting Started tool: Click for guided instructions on how to add, edit, find features and more on Map Maker.